Yep, this had potential. You see, I know a little bit about the Achievement School District (ASD). In fact, I’d sparred with founder Chris Barbic on more than one occasion, and don’t tell anybody, but I danced a little jig on the day he announced his resignation. Ok, never mind, you can tell everybody. The truth is that from the beginning in Tennessee, the ASD has never been anything but one big hustle, and somewhere along the way they became nothing but just another charter authorizer. But I’m getting ahead of myself. The whole “achievement school district” trend began in New Orleans in 2003. It was meant as a means to take the lowest performing schools and devote more resources to them as a means to improvement. Pierre Capdau School in New Orleans became Louisiana’s first takeover school in August of 2004 and then became Louisiana’s first Recovery School District (RSD) charter school. Four more schools were added in the spring of 2005. On August 29, 2005, Hurricane Katrina hit and changed everything. In the wake of Katrina’s devastation, the Louisiana State Legislature passed Act 35, which resulted in the RSD taking over 102 out of 128 schools from the Orleans Parish School Board. Those schools were then converted to charter schools, and only five remained with the Orleans Parish. Today’s RSD bears little resemblance to what was originally envisioned. Reformers like to talk about what a great success the RSD has been, but unfortunately a closer inspection of the numbers doesn’t bear that out and the RSD is now being phased out, albeit with some trepidation. Still, it was enough of a perceived success to get Tennessee to want their very own version of the RSD, called the Achievement School District. In 2011, the ASD was established with Chris Barbic as its head, and their assigned task was taking the bottom 5% of schools to the top 25% of schools within 5 years. I know, there will always be a bottom 5% and we could spend days outlining the ways the ASD has been a failure, but for the sake of brevity we’ll just leave that to educator and blogger Gary Rubenstein. Suffice it to say that Barbic left last year and Malika Anderson is now in charge, and she’s changing the mission a bit, trying to buy the ASD more time to bring up those test scores. Hopefully that gives you enough background information so we can jump back to the breakout session. Paul Pastorek kicked off the session, and if there was any thought of this being anything but a victory lap, it was quickly dispelled. Pastorek produced a number of slides showing the fantastic growth of New Orleans students since Katrina. It was very impressive, except he forgot to mention a very important fact: these weren’t the same students as before. Katrina caused a mass exodus of the population because of its devastating effects. Many of those people never returned. Today, much of New Orleans looks like a totally different city than it did pre-Katrina. It is a whole lot more white and a whole lot less poor. This alone makes it impossible to compare results of schools and students. Pastorek did share something that I’ve never heard before. The key to the Recovery School District was that they were not going to engage in anything they referred to as “contractual politics.” That means they weren’t going to tell schools when the buses should run, what to serve for lunch, what to pay teachers, how long the school day or year should be, or any multitude of other decisions that go into running a school. The RSD was only going to focus on making sure that all schools were “good ones,” and their major priority was shutting down “bad” ones. Pastorek never did say what constituted a good school, but based on the bragging he did about test scores, it wasn’t hard to decipher. This is an interesting theory because it attempts to isolate what happens in the classroom as being the only thing that impacts learning. I would argue that transportation, quality of meal offerings, and satisfaction of teachers all directly affect a child’s educational experience. Nashville has learned this lesson the hard way when it tried to save money by outsourcing janitorial services. There may have been a slight cost savings in the beginning, but you’d be hard pressed to find anyone who’ll say that the environment of schools has improved or even been maintained since the change was implemented. Inadequate services have led to a proliferation of brown recluse spiders and mold. Neither which is conducive to learning. I can feel you Nashville teachers nodding as you read this. In fact, Nashville’s experience closely mirrored that of Chesterfield County Public Schools near Richmond, Virginia. Pastorek cited this lack of focus on making sure schools are “good” as the main reason for the failure of the Michigan’s Education Achievement Authority. (Noticing a common theme here yet? Failure?) He related how he adopted the mantra of closing a bad school “at any cost.” During the question and answer period of this session, a gentleman who had been a teacher in New Orleans during Pastorek’s tenure took exception to this, pointing out that hundreds of teachers lost their livelihood because of the “close at any cost” mantra. There were many teachers and their families whose lives were irrevocably ruined, not to mention the students, whose lives were upended as a result of these closures. Pastorek walked his comment back a bit after that, but he never fully retracted it. Malika Anderson spoke next and spun the narrative that the Achievement School District was a success in Tennessee because schools in Memphis’s Innovation Zone, or iZone as it’s commonly referred to, along with statewide priority schools, were performing so well. She stated that schools had years to improve and had failed to do so until now, and it was only because of the fear of a state takeover that made this happen. She glossed over how far the ASD was from reaching their goals. She completely ignored the fact that many were ready to see the ASD go the way of the RSD and have schools brought back under local oversight. Her argument was that in spite of failing to make real progress, the ASD should still be rewarded with more time for inspiring through fear. Here’s my challenge to you. Go into work tomorrow and tell your boss that the only reason everybody in the company is doing so well is because they are all worried that you are going to suddenly stop sucking at your job sometime soon. Tell him you know your work isn’t up to par, but you should be considered an asset because you’re making everybody else perform at a higher level through fear of you actually doing your job. Make sure your boss knows they should be pouring more resources into you because this work is hard and eventually you might be, maybe, performing at a semi-acceptable level. Let me know how that goes because that’s what the ASD is doing, and it should be met with the same howls of laughter followed by dismissal that it would if you said it to your boss. Yet for some reason it is not the case with the ASD. They still keep dodging legislative bullet after bullet, buying themselves more time. Chris Reynolds, head of LEAD schools, shared the great success that LEAD was having. This allowed me to ask a question, since it related to a school here in Nashville, Neely’s Bend Middle School. Neely’s Bend was one of two priority schools under consideration by the ASD for takeover last year. They were chosen despite parents repeatedly saying they didn’t want to be taken over. Parents got wind of a provision that supposedly stated that if a school made sufficient growth on the statewide standardized tests, they would not be taken over. Parents, along with teachers and other community members, pulled together and the students produced a 5 in growth, the highest possible. A score that was, in fact, higher than LEAD Academy’s other ASD school, Brick Church MS which produced a 1 in growth. Alas, the provision did not exist at that time and the takeover proceeded. Anderson stepped in and gleefully expressed how this situation lead to a new statute being written. One that gave a targeted school a year to show growth. Had this statute been in effect last year, Neely’s Bend would have remained with MNPS. Anderson thought this was a great new statute and that the Neely’s Bend community should be proud of their accomplishments. And yes, the takeover was continuing. Reynolds acknowledged that the scores were higher and the takeover was still proceeding. He did point out that LEAD’s other 3 schools were 5’s. So even though this district school was showing growth at the highest level, the ASD still took over. This just isn’t fair and goes against the ASD’s supposed model. But it will certainly make them look good since they won’t have to work as hard to turn the school around. Voters in other states need to pay particularly close attention to these narratives since a move is afoot for other states to get their very own achievement school district. Is an achievement district really a wise investment? Chris Barbic has a new job that, along with former Mindtrust executive Ken Bubp, allows for him to promote achievement districts. (Nashville readers need to pay attention to the name of Bubp as he sits on the board for Project Renaissance.) 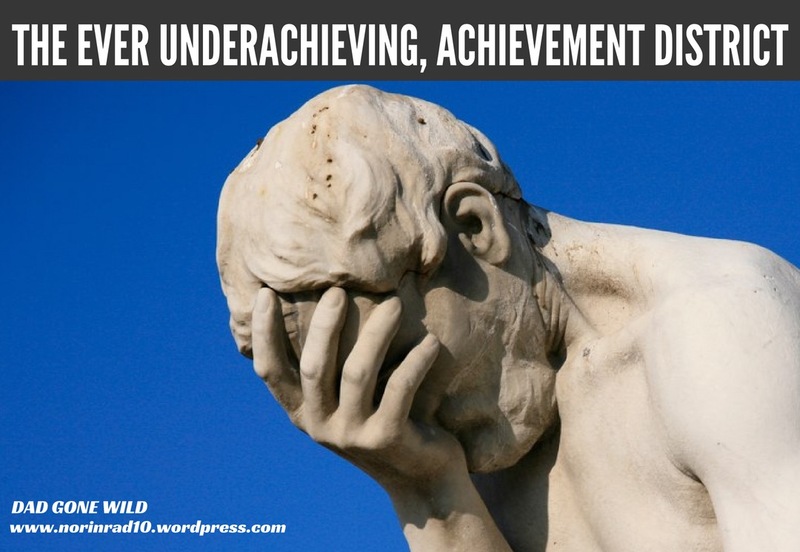 Right now, legislators are hearing all puppy dogs and rainbows about how having an achievement school district will be a boon for children trapped in “failing” schools. Don’t let them fool you. There is no record of a successful achievement school district anywhere. In fact, it is just the opposite. Proponents are so desperate for a success story to point to that they’ve begun counting Denver as an achievement school district based on its use of the portfolio model. Again, don’t be fooled. Denver is also not what it appears, unless you are comfortable with 27 new charter schools in 5 years with 40% performing below standard. I would be very careful in approving the creation of an achievement school district if I lived in Georgia, North Carolina, or anywhere, for that matter. Once empowered, dissolving it becomes very difficult and family input is minimized. In Tennessee, it seems to have become virtually impossible to get rid of the ASD. Louisiana is supposedly dissolving the RSD, but one needs to be cautious in being too celebratory. While schools in New Orleans are returning to oversight by an elected board, the elected board is extremely limited in the scope they can supervise these schools. The publicly elected board will be responsible for systemic functions like enrollment, discipline, and deciding whether to open or close schools. But the independence of individual schools will be protected by state law. This means that they will set hours, curriculum, staffing, textbooks – all devoid of interference from an elected board. States are better off empowering local districts to create innovation zones. In Memphis, the iZone has been consistently outperforming the ASD. Part of the reason for that is the iZone is deeply entrenched in the local communities, whereas the ASD is viewed as an outsider taking over schools in a hostile manner. If states really want to help their low performing schools, models like the iZone are where they should be putting their money. Not in another scheme that will produce nothing but false narratives and more charter schools. Charter school proponents like to level charges at public school supporters that they are supporters of the status quo. I don’t know how to break it to them, but at this point, after 10 years, the education reformers have become the status quo. We now have ample evidence that their way does not work. As Wendy Lecker, former president of Stamford’s Parent Teacher Council, says in a recent piece, “The evidence demonstrates that turnarounds produce at best temporary small increases in test scores, but at the high cost of destabilizing schools and communities in the long run.” She goes on to say, “While policymakers stubbornly pursue this dead end, they ignore evidence from science and educational practice pointing to methods that result in long-lasting improvements in both academic and life outcomes, especially for at-risk children.” The NAACP this week called for a moratorium on charter schools . The writing is on the wall – we just have to decide if we are going to read it and take action. Dad….what they all fail to recognize was the RSD, ASD, vouchers and all Charters never was about improving poor performing schools, choice or helping the poor. The agenda is the total opposite of what the snake oil salesmen are selling to the elected who are either bought and paid for or too lazy to do any independent research. The ASD has only one goal and that is to shut down all traditional public schools, eliminate elected school boards which in turn results in no choice and no voice for parents. Just talk to parents in New Orleans. Barbic is a graduate of the Broad Superintendent Academy. Broad has only one goal. That goal is to privatize public education and line his pockets and the pockets of his buddies Gates and Walton. Time to END Charters in TN but too much $$$$ has passed into our elected campaign funds for that to happen. Which again brings us to the only solution to all the problems that have occurred and are yet to occur. Educate your kids at home. It is too late to save public education and personally I do not feel it deserves to be saved. We the people allowed this to happen by allowing our elected to go unchecked so now it is up to us to take the only steps available. It is time to STARVE THE BEAST. I would like to talk with you. Quite practically, most parents are not equipped to home school their children–either intellectually or financially. Spoken like a truly uninformed public school advocate. Your statement is not only insulting it is flat our wrong. ANYONE can home school. Home school today does not mean the parents actually have to do the teaching. If they are not equipped to teach their children (most find they can teach) there are many great programs that can help. Some are free and some cost money. But ANYONE that truly cares about their children getting a good education and not being indoctrinated can be an effective teacher at home. Parents teach their children to walk, to talk, to feed and clothe themselves and they teach them many, many skills. Parents are natural born teachers. Some better than others but we also have good teachers and bad teachers in the public school system too. The public school system is no longer a safe place for children. With the onset of SEL it is now more dangerous than ever. The school has no business teaching our children how to think and feel. They have no business determining the belief system of other peoples children. No I beg to differ with you. Home school is the ONLY safe place for kids today. Most kids will learn more at home than they will in the public school system. These children are happier and better adjusted than most public school kids. I have seen first hand the difference in home school children vs public school children. Home school children actually talk to people. They can hold adult intelligent conversations. They are not rude. They are not buried in a cell phone or IPad. And they score higher on college entrance exams than public school kids. I am glad to report that home school numbers are rising by leaps and bounds. NC now has more children in home school than in private school and has seen a 34% increase in home school. I believe in the next few years we are going to see this number increase even more.